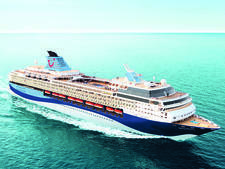 Editor's note: Marella Dream underwent a refurbishment in November 2014, when it was fitted with the following new features: A new sunbathing area; the Asian-themed a la carte restaurant Kora La, specialising in Indian and Chinese cuisine, and the Terrace Grill. The former Argo Lounge and Oceans Bar was converted into The Explorers Lounge & The Coffee Port and Tides Bar, respectively. The 1,506-passenger, 53,872-ton Marella Dream was originally built in 1986 at the Meyer-Werft shipyard in Papenburg, Germany, and named MS Homeric. It was the last ship built for the Italian company Home Lines before it merged in 1988 with Holland America. Under new ownership, the vessel was renamed MS Westerdam; in 1990, it returned to Meyer-Werft to be stretched with the insertion of a 36.9-metre (about 121 feet) mid-section. (From the quayside, it's easy to identify the newer bodywork -- the newer windows are larger than those on the rest of the ship.) The vessel was transferred to Costa Crociere in 2002 and renamed Costa Europa. 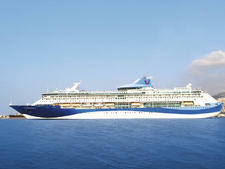 Thomson Cruises took over the vessel in April 2010. Originally designed and built for Home Line's regular service between New York and Bermuda, the ship still has something of the old-fashioned liner feel about it. Its profile is curvy, rather than boxy, the lifeboats are mounted higher than on today's larger cruise ships, and there are large areas of reassuringly solid teak on the Promenade Deck and the tiered after decks, which provide lots of lounging space on substantial steamer chairs. The multimillion refit at the end of 2012 added a burger bar, new buffet line any canopy awning on the open deck aft of the Lido Restaurant. Other major changes included moving the spa from its out-of-the way location to a new, expanded central venue close to the shops. Soft furnishings and carpets in most public rooms and cabins were also replaced. The mainly Indonesian and Filipino team on Dream are extremely loyal, many returning for contract after contract. Most importantly, the fact that passengers are not expected or required to pay gratuities makes no difference to the level of service delivered. Thomson (now known as TUI) was a trusted brand that meant a lot in the British package tour industry. 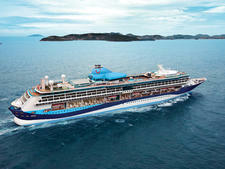 Now known as TUI, it's the UK's biggest tour operator, and customers who have never cruised before but who have travelled with the company to an all-inclusive resort in Spain or a villa in Greece felt comfortable booking a Thomson cruise because they knew what to expect. They knew they would be getting value for money -- although they might not realise there are cheaper deals available on newer ships operated by the likes of Costa, MSC Cruises and Royal Caribbean. As a result, Thomson succeeded in squeezing better-than-expected daily rates from its pre-owned fleet. 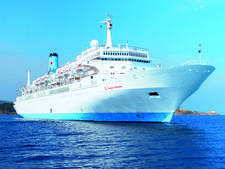 On the other hand, people who think they know about cruising might well turn their noses up at Thomson simply because of that cheap and cheerful, curry-and-chips package tour heritage. They don't know what they're missing. Passengers on Marella Dream are almost entirely from the U.K. and from a wide range of ages and backgrounds, including young couples, working families with young and teenage children, and retired couples. 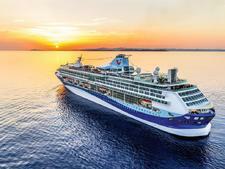 Many are new to cruising, although a substantial proportion have cruised before, either with Thomson (as it then was) or with other familiar U.K. brands like Fred. Olsen and P&O Cruises. The dress code is casual during the day, predominantly consisting of jeans or shorts and T-shirts or sports tops. Smart casual is the most popular option in the evening. There is one formal night each week, usually the captain's gala cocktail party. Despite the restrictions imposed by baggage allowances on flights to the Caribbean and the Mediterranean, the majority of passengers wear formal dress (tuxedos for men and long frocks or cocktail dresses for ladies). No gratuities are payable or expected. The onboard currency is the pound sterling.